Our film promotion activity consists inter alia of participation in major festivals, special screenings, exhibitions, minifestivals, information packages and professional representation. And of course there is the Cinematheque. The Romanian Cinematheque. Click here for our film events. The events pass, the books are here to stay. For RCI London, the promotion of Romanian literature is a perennial priority. Most of our editorial projects are carried out with the support of the Romanian Cultural Institute’s National Book Centre in Bucharest. The goal is to publish the best in Romanian literature and with the best publishing houses. Click here for the literary events. Our arts programme, hosted in the Institute's Brancuși Hall, presents significant names and trends in Romanian arts of all generations and in all eras. 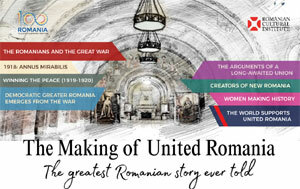 With the support of the RCI, Romanian artists also exhibit in well-known museums and galleries in and outside London. Our art programmes include design, fashion and architecture - hence extending beyond traditional boundaries. Conferences, special exhibitions and diplomatic events that make our programme even more flavourful and diverse. Click here for our special events.